My DIY feeder basically consists of a chick feeder (found at any farm supply store - $3.00) and a small jelly jar. To make a hanging version I drilled a hole in the jar using a 1/4" diamond drill bit and used a long 1/4" eye bolt. If you want to add a plate, just drill another hole in the plate using the same drill bit then add nuts and rubber washers to hold everything in place (a little bit of thread lock helps to make it secure). 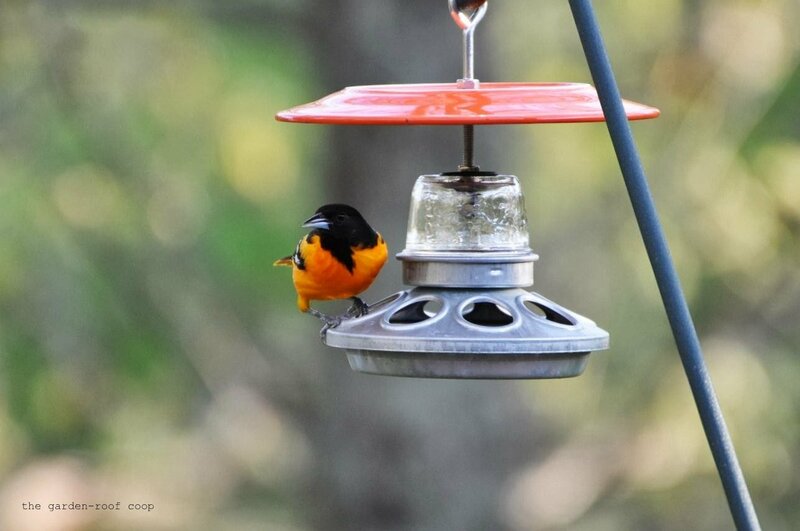 Baltimore Orioles seek out ripe fruit. Cut oranges in half and hang them from trees to invite orioles into your yard. Special oriole feeders filled with sugar water supplement the flower nectar that Baltimore Orioles gather. You can even put out small amounts of jelly to attract these nectar-eaters (just don't put out so much that it risks soiling their feathers). Planting bright fruits and nectar-bearing flowers, such as raspberries, crab apples, and trumpet vines, can attract Baltimore Orioles year after year. 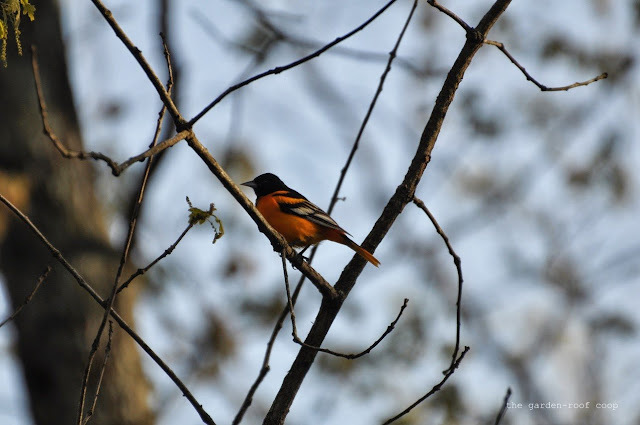 what a beautiful series...love the bright belly on the oriole! I love this!!! And your animation at the end is super too. I don't have a diamond drill bit, but maybe I can convince Bud to buy one. LOL [we have orioles in Spring and Fall] The woodpeckers here drink the same mixture as do the orioles and hummers, so I'm wondering if this would work for at least the woodpeckers too?!!! Great info. I'm gonna bookmark you link. 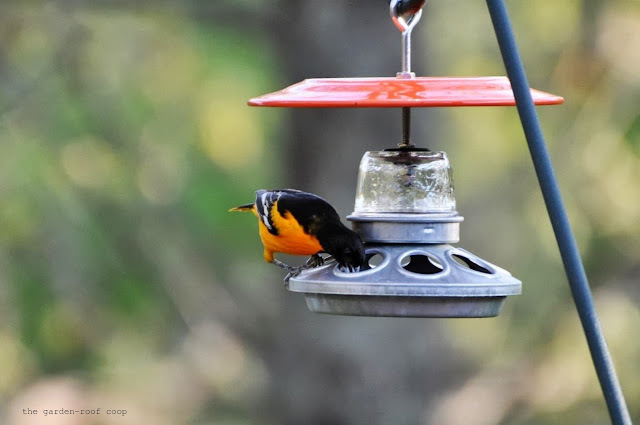 Great idea for an Oriole feeder. Love the orioles too, great shots! At least you took the time, it looks good to me. And that Oriole is a little beauty. 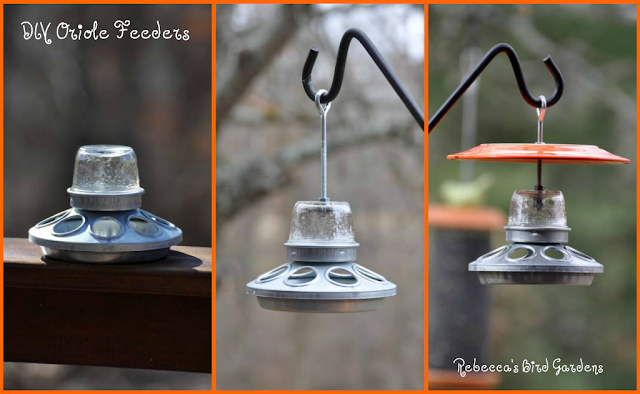 Beautiful birds and a very useful bird feeder. Oh, wow! I tried unsuccessfully to lure some orioles last year. I'm envious! Great series of shots! 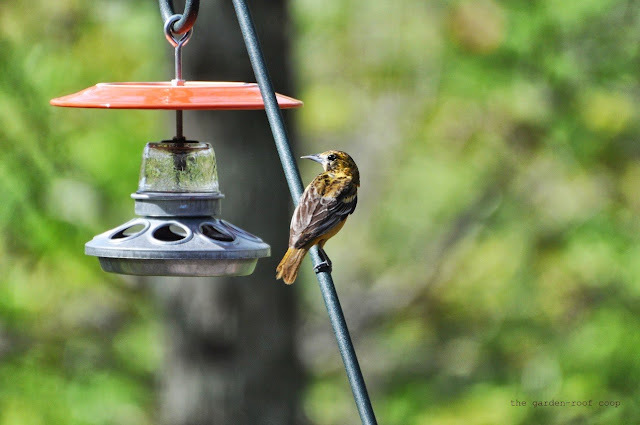 These bird feeders are a good source of photography. I the right light the feeders could end up on the X Files! We have had orioles perching on our regular bird feeders over the last couple of days, so I bought an oriole feeder. I actually just put it up this morning. (Wish me luck!) Love your homemade version. PS...Hi again Rebecca....I'm now in Hootin' Anni's Admin instead of my birding blog. I was here yesterday and did bookmark this, and I'm back to show Bud what he needs to make the feeder for me and the birds. LOL Thanks for visiting with me and leaving a comment about the Hummer Nest. What a GREAT bird feeder!! Love it! and LOVE the Orioles! Great feeder, I will have to try making it! Great capture of those beauties. Boom & Gary of the Vermilon River, Canada.